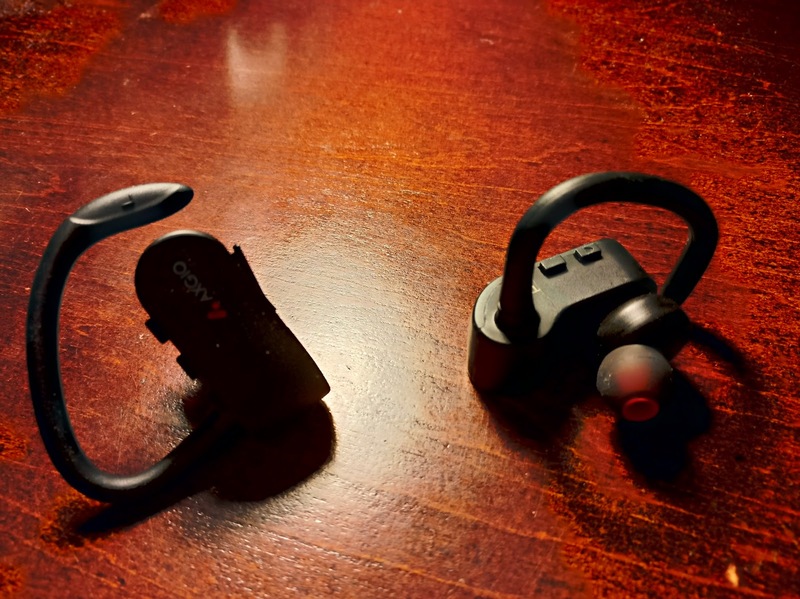 For some time, I was looking at buying some wireless headphones mostly for two reasons. I have a pair of Samsung Level U bluetooth headphones, which are good, but I find the part that goes around your neck to be annoying as I’m running on the treadmill or elliptical. I also have a pair of regular bluetooth headphones (with a cord combining the two speakers) which are also good. Since there are a few companies who are making bluetooth headphones now, I figured I’d buy a pair and see how it goes. I purchased the ones made by AXGIO for two reasons. They were on sale on Amazon and the design looked good to where they don’t look ridiculous in my ears. Reading the reviews made it worth my while to buy them and try them out. Since I wear them at the gym for the most part, I would review based on those conditions. For the most part, they are comfortable on my ears. While the ear hooks are stiff, they hold to my ears well so they stay in place while running. The quality is good overall with more treble than bass. This helps when listening to podcasts and rock music but not so much with other forms of music. The only drawback I can think of right now is the battery life but I’m still testing that as I have been using them outside my regular gym usage so it seems lower than usual. I am keeping to my usual charging habit of charging them 2 to 3 times a week to ensure they are as charged as possible for when I need them.